Cathcart William Methven was born on 24 September 1849 in Edinburgh, Scotland and died on 30 August 1925 in Pietermaritzburg, KwaZulu-Natal, South Africa. He is well-known for his work as the Durban's Harbour Engineer in the 1890s, as well as an architect, musician and artist in which capacity he founded the Durban Art Gallery in 1892. For 18 years Methven was the assistant harbour engineer at Greenock in Scotland and engineer-in-chief of its Harbour Trust. An eminent Victorian engineer, he was elected a member of the Institute of Civil Engineers (MICE). Methven was appointed Durban's harbour engineer in 1888 with the specific task of removing the sandbar at the harbour entrance in order to make the Bay safe for shipping. During his tenure Durban Bay was transformed from a tranquil stretch of open water to commercial harbour with a forest of masts alongside the Point wharves. By 1890 seven acres of land had been reclaimed and electricity was introduced to the Point. In 1892 hydraulic cranes increased the handling capacity of the harbour and in 1893 timber wharves were replaced and extended. Methven designed Durban's first dredgers, the Octopus and the Beaver. However, the development of Durban harbour was the political football of its time and Methven's plans brought him into conflict with a prominent lawyer and politician, Harry Escombe. Natal's first Responsible Government dissolved the Harbour Board and dismissed Methven on 11 July 1894. On 13 December 1895 Methven started business as an engineer, architect and surveyor. He surveyed every harbour on the south-eastern seaboard including Port St Johns (1897), Port Alfred, Kalk and Mossel Bays (1901), Richards Bay and Cape Town (1902), East London (1901 and 1910), Maputo (1909/10) and Beira and Port Elizabeth (1911). He was President of the Natal Institute of Architects (1905 - 1908) and a Fellow of the Royal Institute of British Architects (FRIBA). Methven was involved in many associations. He was President of the Natal Society of Artists (1908, 1912 and 1915). The organs in the Durban and Pietermaritzburg Town Halls were built to his specification. He edited A Century of Progress, 1824 - 1924 (Pietermaritzburg, 1924). 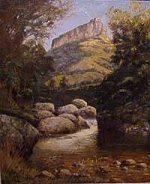 However, Methven is best remembered for his fabulous oil paintings of Durban Bay and KwaZulu-Natal landscapes. He held his first solo exhibition in Johannesburg in 1921. Methven's work is represented in the Africana Museum, Durban Art Gallery, Local History Museums, Tatham Art Gallery and the Killie Campbell Collections.